I must say – I am in love with a lot of stuff. My husband, my kids, my family, my pug, my tall leather boots … and this watermelon birthday “cake” that my friend Becky was kind enough to share with me. I mean, just look at it! It’s a thing of beauty. And good health. And deliciousness. I’m not sure how she stopped people from swiping those kiwi off the top along with a big blob of lemon yogurt cool whip so she could take these pictures. Anyway, this is pretty simple and would be perfect for a school or classroom party… or end of the school year party, or field day party, or birthday party, or Easter party, or just any-day-that-you-can-get-your-hands-on-a-watermelon party. Becky said she chilled the watermelon first. 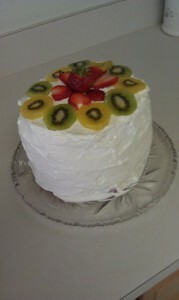 And since her watermelon “cake” came out so beautifully, I’d listen to her. Slice off the bottom of the watermelon so you have a flat surface and then cut off all the rind all the way around the rest so that the bright, pink watermelon flesh is exposed. If you want a flat top “cake” then slice off the top too. Some people prefer a rounded top. Do whatever you want. You are holding a knife, I’m not going to argue. Prepare the frosting. Gently fold the lemon yogurt into the Cool Whip. Something about this combination causes it to firm up. I have no idea what, so let’s just go with it and be thankful for science. Pat the watermelon. Pat, pat the watermelon. Pat the watermelon with a soft, clean towel. (Ha! Flashbacks to Pat the Bunny, anyone?) 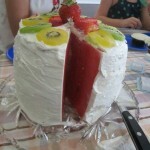 Just make sure the watermelon is not too wet and runny before you begin adding the frosting. Garnish with kiwi – or berries or whatever you like. Just, please, no candy or marshmallows. Let’s keep this healthy, shall we? You must keep this refrigerated until you serve it. Whatever the science is that makes the lemon yogurt and Cool Whip firm up will not last forever. Eventually it will start to go all slump-y (not a word, but you know what I mean), so be sure to refrigerate the leftovers too.